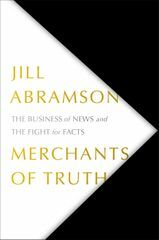 Book author Jill Abramson is a senior lecturer at Harvard University. She also writes a bi-weekly column for The Guardian about US politics. She spent seventeen years in the most senior editorial positions at The New York Times, where she was the first woman to serve as Washington bureau chief, managing editor, and executive editor. Before joining the Times, she spent nine years at The Wall Street Journal.